Whether it’s a large hotel, hospital or other facility where a large amount of laundry needs to be processed quickly and efficiently, commercial laundry equipment is often used due to its capacity benefits and durability. Even the most rugged laundry equipment has its limitations and it’s therefore very important that the operators of these machines understand the equipment’s limits and avoid overloading the laundry equipment. Industrial weighing scales offer a way for staff members to constantly monitor the amount of laundry they’re placing in commercial washing machines and dryers to avoid overloading. Why Use Industrial Scales When Processing Large Amounts of Laundry? Commercial laundry equipment is extremely expensive. For companies that process large amounts of laundry, downtime can be equally, if not more expensive. Think about a hotel not being able to wash towels or sheets for hundreds of hotel guests, or a hospital being unable to wash soiled sheets and towels. In some industries, broken down laundry equipment simply cannot be tolerated. In these instances where laundry equipment is so vital, it’s critical that organizations do all they can to keep their equipment running smoothly day in and day out. With an industrial weighing scale, users can monitor the weight of each load of laundry to avoid overloading, which can be detrimental to laundry equipment. By staying within the manufacturer’s recommended weight limit, companies can extend the life of their laundry equipment, reduce downtime and save money all at the same time. If you’ve just begun your scale purchasing journey, you may never have heard of Arlyn Scales. We’ve been in business for more than 30 years, which has allowed us to continue to develop the highest quality industrial scales possible at competitive prices. One of the reasons we’ve been able to continue to innovate while keeping our costs down is due to our location and business model. We’re headquartered in New York, which means that both our design and manufacturing teams are located in the same facility. This allows our different team members to work closely together to quickly resolve issues and alsoalways stay focused on ways that we can improve our scales for our customers. Aside from our US based design and manufacturing facilities, we also sell factory direct to our customers as opposed to working with distributors. This also allows us to keep our costs down while keeping us closely involved with how our customers are actually using our scales. This has allowed us to develop a number of groundbreaking features that may not have come about had we been disconnected from our customers through a different type of business model. For quite a long time, laundry facilities were forced to use mechanical beam scales, which were extremely expensive and could be difficult to read. As platform scales became more affordable, laundry facilities began to use them in place of mechanical beam scales. 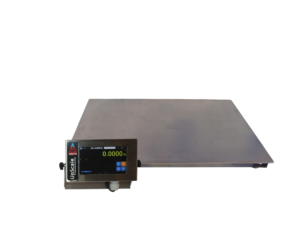 Arlyn Scales has a large line of platform scales with capacity ranges between 500 – 1000 lbs., and resolutions of between 0.1 – 0.2 lbs. These Series 3200 platform scales have a wide array of features that make them ideal for laundry facilities. To increase durability, we offer the option of stainless steel platforms to help increase the reliability and durability of your industrial scale. Laundry scales can take quite a beating, and stainless steel platforms can help to protect the interior components of the scale from abuse as well as caustic chemicals. All of our platform scales come equipped with stainless steel load cells, which are much more durable than the inferior metals used in other industrial scales. These stainless steel load cells allow our scales to be less susceptible to shock loading or overloading, which are common problems with many industrial scales. Not only are our load cells made from stainless steel, but we also utilize four load cells each recessed in the corners of the scale platform for added protection. This unique design feature allows our scales to avoid using a summation board, which is one of the common points of failure in many industrial scales. Depending on the size of your laundry carts, you may need a custom platform size to adequately handle your laundry weighing needs. Due to our factory direct approach, you can work with our design team to build a custom designed scale with a platform size that exactly meets your needs. This will ensure that the industrial scale you purchase serves your needs precisely as opposed to having to make due with what’s available ‘off the shelf’ from other scale manufacturers. Recently we’ve released our Arlyn UpScale Touchscreen Indicator, which is a completely new scale display that is powered by an Android touchscreen tablet. This allows you to not only view weight readings, but also to completely control your scale from one easy to use interface. We’re extremely excited about how this new scale display is completely changing how our scales are used on a daily basis. Ready to Purchase a Platform Scale for Your Laundry Weighing Needs? We hope we’ve answered all the questions you have about a platform scale for your laundry weighing needs. If you’re still unsure about the correct scale for your unique application, don’t hesitate to reach out to our team today by phone at 800-645-4301 or through our online contact form. We look forward to helping you find the optimal industrial scale to increase efficiency within your laundry facility.